While my main focus is on nutrition and health, I do keep in mind that the best companion of good eating is staying “active”! 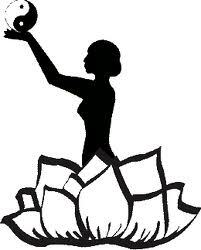 Unfortunately I am not a fan of long hikes and running marathons, yet my activity hobbies (whether zumba, swimming, or yoga) are continuous and keep me moving. Personally, I think it is unwise to focus either on food or physical activity solely (I believe food can lead specifically to stronger body weight management outcomes than activity, but we shall discuss it later), but luckily taking care of one usually results in improvement in both (from what I have observed). Currently, public health recommendations encourage people to engage in 30 min per day or 150 min per week of moderate-to-vigorous activity, and this represents only 3% of the time we spend awake. That is really not that much, and indeed used to be very easy to achieve without any conscious effort. However, more&more studies on the issue of sedentary behavior (TV watching, dissertation writing 0_0) are emerging and might need their own recommendations. There is evidence that sedentary behavior has a negative independent effect on health (so, you might be going to the gym 5 times a week, but if you are sitting most of the rest of your time this leads to poor health regardless of all that gym time). Definition: The term sedentary behavior (from the Latin word sedere, “to sit”) describes a distinct class of activities that require low levels of energy expenditure in the range of 1.0–1.5 METs (multiples of the basal metabolic rate) and involve sitting during commuting, in the workplace and the domestic environment, and during leisure. Currently, optimal levels of sedentary behavior to recommend the public are not known. I never heard of “Freshman 15” until my first year in graduate school studying public health… since I never had been a freshman in the United States. It seemed like a rather obvious fact- I knew very well the food environment on campus and how one can gain weight quite easily in it. Yet when I told my friends and family back in Ukraine, they were quite amused and surprised- how can you gain weight in college!? When I moved to Kiev, the capital of Ukraine, for my freshman year in 2003, I heard references to the “poor student” from all directions. Apparently, a new university student was poor, hungry, and rather slim. This idea is mostly based on the student image of the previous generation, however. The students in 2003 were not as pale and hungry as my parents remembered it- but they were definitely poor and slowly losing weight due to not having home-cooked meals made by moms as before. In 2003 students had more choices to eat out, but the prices prevented us from doing it often- you ended up cooking at home, snacking, or eating at the cafeteria. Indeed, many ended up losing weight, thus the freshman “-5” (about 2.5 kilograms; my term, arbitrarily chosen just like the “15”). The following picture is of a cafeteria “full/wholesome lunch” at one of the biggest universities in Kiev taken several days ago. 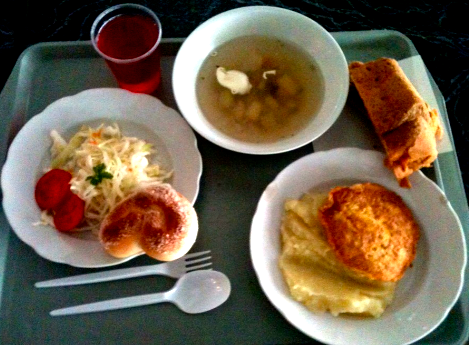 It costs $2.50 and includes: fresh broth-based warm soup, small cabbage salad, main course of a meat patty and mashed potatoes, piece of dark rye bread, and “kompot” (freshly boiled fruit drink) as well as a small pastry (dessert, I suppose). Approximately, a meal like this is roughly 700 calories. It would probably be the main meal for a student, who grabbed a quick breakfast and will attempt to make some food at home at the end of the day. The main feature of this wholesome/full lunch is- while one might not necessarily consider the addition of pastry, potatoes and a piece of fried meat healthy- the portions are very conservative. The opportunities to overeat are indeed limited. It would be unfair to compare this to an “American” lunch since a standard American lunch does not exist- the dining halls are using the buffet style so a student is free to choose as healthy or unhealthy as they want. Of course, based on the numerous freshmen focus groups last semester, the common sentiment is that choosing “healthy” is quite hard and annoying: the salads are tasteless, the fried and burgers are omnipresent and a dessert lurks around each food station corner. Plus there’s constant social snacking and eating out- taco bell at 2am, burger king for a cheap dinner… Gaining a freshmen 15 is no problem at all. On the other side, a Ukrainian student increases his/her physical activity by simply going to and from the university (often a trip of about an hour each way), lack of pocket money for fast food, and rather appropriate (and I would argue “healthy”) home meals at the cafeteria. It is simply the difference in environments– Ukrainian students do not possess a superior understanding of healthy eating necessarily or boast superhuman will-power capabilities.. they are constrained by resources and are exposed to the environment where overindulging opportunities are lower than, for example, at an American university. P.S. I also believe more eating norms exist in Ukrainian culture that might prevent overeating and junk food consumption in general..but that’s hard to argue at this point. Since i pondered on the varying rates of overweight and obesity in my previous post, I thought it’d be good to share some epidemiology [social statistics of obesity] on the subject! So while in the US 1/3 of Americans have obesity (BMI of 30 or higher), it is definitely not an American problem. All over the world there are 1.5 billion people that are obese. In the US particularly , the societal factors most linked to obesity are: education years, socio-economic status, food habits, socio-cultural environment, and poverty. Some folks argue that the most important factor in causing obesity is the change in culture- global modernization, urbanization, computer lifestyle, access to fast food, driving a car vs. walking. In China and India, for example, modernization goes along with the development of obesity (obesity rates accelerate there way faster than ever seen in the US!). These cultural changes are not really “changes” to us any more- they are pretty much natural. For example: eating at a fast food place on the run once every other day or your job consisting of sitting on the chair 90% of the time. The concept being talked about is the “toxic environment”– having increased access to unhealthy food choices that are convenient and inexpensive, sedentary-promoting environment. This of course is a nice potential explanation. Even as I think of Ukraine and a lower rate of extra body weight: for the most part people cook meals at home vs. eat out. Why? It is simply cheaper. As a bonus- it is also seen as much healthier (depends if you want it to be). But would people spend time on making a healthy dinner at home if McDonald’s became 5 times cheaper? No, I think we would have the same situation in the US where 44% of people eat fast food once a week at least. That is the official information shared by Dr. Levine from Mayo (who also works at my university with the Obesity Solutions initiative). I have heard many other explanations for why the world’s population is getting heavier. The ones related to food range from toxic food (GMOs, high fructose corn syrup), artificial sweeteners and other ingredients, MSG, gluten, pasteurized foods (e.g. dairy) and so on. My thought is… Living your life in this new world is definitely a struggle if you want to have a normal weight and feel your best- it is almost a fight against nature (nature now being replaced by the iron jungle of the city). Suddenly you have to pay attention to every ingredient, find the time to sign up for a gym and squeeze in some physical activity in your schedule, spend energy on finding not-so-toxic products that probably cost more, etc. But of course it is all about trade-offs… people all over the world are looking for convenience, for a break from hard work. They seek ways to improve their live by modernizing, having transportation, not needing to spend half a day cooking meals and then cleaning after. Yet this comes at a price of poor health eventually. Could your body “tell” you what to eat due to its health state? If you’re deficient in a certain nutrient…will you instinctively crave foods with that nutrient? Many believers in the “body wisdom” would say yes. Actually, i think the idea of body wisdom is extremely popular- I myself know this from the raw diet, and I am sure many alternative “natural” diets talk about this concept (e.g. intuitive eating?). I think it is fascinating- that’s why I was excited to talk about this in my psychology of eating class. I tried to find a relevant peer-reviewed article for class discussion, but to my surprise found nothing. In class I understood why- there is no evidence for body wisdom in the literature. There originally was an idea that our bodies can tell what we are deficient in and gravitate towards foods with those nutrients- first rat studies seemed to prove that. They had rats on a thiamine deficient diet choose between two new diets- one with thiamine, or the previous thiamine deficient one. The rats chose the thiamine diet. They could tell they needed vitamin B1, right? Not really- turns out the rats avoided the same thiamine-deficient diet not because they could sense the deficiency, but due to the learning that the original diet made them somehow sick. Animals, thus, avoid eating whatever doesn’t make them feel good. They, like we, learn to eat what makes us feel good. The only thing you can have a specific hunger for (so you’d be able to choose food with that particular nutrient in it) is salt- it is easy to taste/identify and we have a genetically preprogrammed specific hunger to it.